← The Fight Continues…Steps Forward! Early Tuesday morning, what would have been the 18th day of the Sit-in and 12th day of the People’s School, the OUSD police, along with other police forces from across Oakland raided the encampment and school. While participants were allowed to remove their items, the police arrested a parent as well as a former student of Lakeview, and subsequently constructed a fence to block entrance to the school. Lakeview Elementary has been a fixture of this neighborhood for nearly 100 years and supported the development of thousands of Oakland children. The moving trucks began to arrive this morning to clear out classrooms highlights the question: should Oakland allow the this space, so central to the vitality of the community, to be dismantled and made into district offices. The Lakeview building was critical to the maintenance of the People’s School. Although we have been evicted from a school that belongs to the community this does not signify defeat, or that the group has given up on the fight for quality education. The People’s School will continue next week on Tuesday and Thursday. 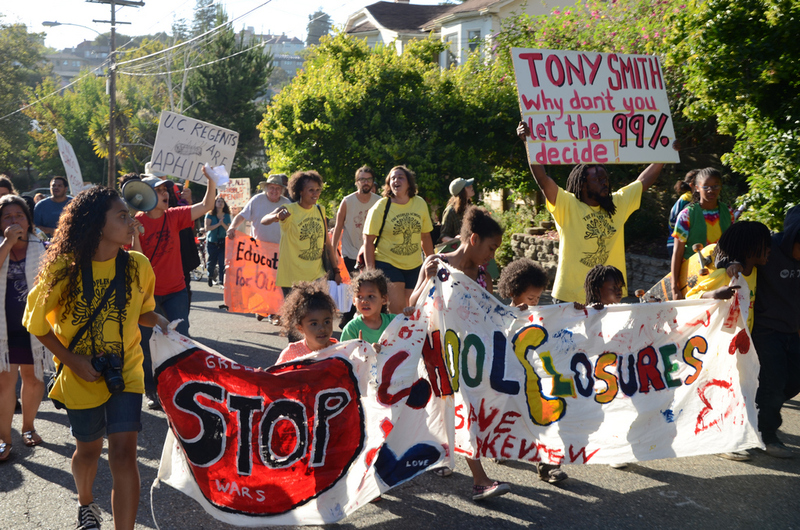 In a recent article Oakland Tribune education reporter Katie Murphy, she writes that Tony Smith believes “that schools can—and must—help transform entire communities through love and a sense of collective responsibility for children.” While the People’s School, and the Lakeview Sit In directly attempted this through providing free essential services to children, Tony Smith’s actions directly contrast this statement. The closure of schools and displacement of thousands of children to already overcrowded schools does not cultivate a loving supportive environment for children. Instead it negatively impacts the ability for parents to transport their children to school, ruptures the relationships of students from their teachers and one another, and destabilizes essential support systems for entire communities. Tony Smith is quoted saying that he hears the “discontent with the current outcomes” and that he realizes “the change isn’t happening fast enough for everybody.” Currently the trajectory of Smith’s policies point to change in the wrong direction. If the change he wants is the cutting of services and programs such as adult education and special education, attacking teacher’s and school workers, school closures, and privatizing education, there will be nothing left of the public school system when Smith leaves. The People’s School has been a success and provides a model which other’s can use for re-imagining a more enriching and empowering public education in stark contrast to the system Tony Smith is propagating. It has become a symbol of resistance and received positive support from the Oakland community, thus it will continue for two days next week. Beyond the People’s School the Lakeview Sit-in continues to build a powerful community-labor alliance and picket sanctioned by the Alameda Labor Council to block the move-in of the administrative offices at Lakeview. In addition, in the continued effort to connect the fight against the criminalization of black and brown youth with the dismantling of the public education system members of the sit-in are joining the march for Raheim Brown, a youth murdered by OUSD Cops at a Skyline High Dance today Friday, July 6th at 11 am. His murderer was the sergeant who gave the dispersal order during the raid on the Lakeview Sit-in. There will also be a celebration and convergence focusing on Public Education next Sunday, July 15th at 5pm at Splash Pad Park featuring performances by Boots Riley and other speakers.